Artist Sohan Ariel Hayes says his way of looking at Perth has changed for good, thanks to the research he undertook for new work Nine Streams in the Borna Malliji (Tree of Shadow). Establishing a close working relationship with Wadjuk local Barry McGuire early on in the making of the work, Sohan was able to hear stories of significant West Australians, and learned about the overlap of land use between Indigenous and non-Indigenous people – a point of connection fitting for a work about reconciliation. Originally conceived as a series of 12 portraits constructed from archival material and filmed re-enactments, the artwork now has evolved to become nine streams of West Australian future and history; pre-settlement, settlement, language, songlines, emblems, marriage, politics, ceremony and future. What was the collaborative experience like? Any new insights or relationships gained from the consultation process? The collaborative experience on this projection began with the Commissioning Party (Mirvac Old Treasury Pty Ltd) and the Art Consultants (FORM) who have been, from day one, one hundred per cent behind the spirit of reconciliation that this work projects. 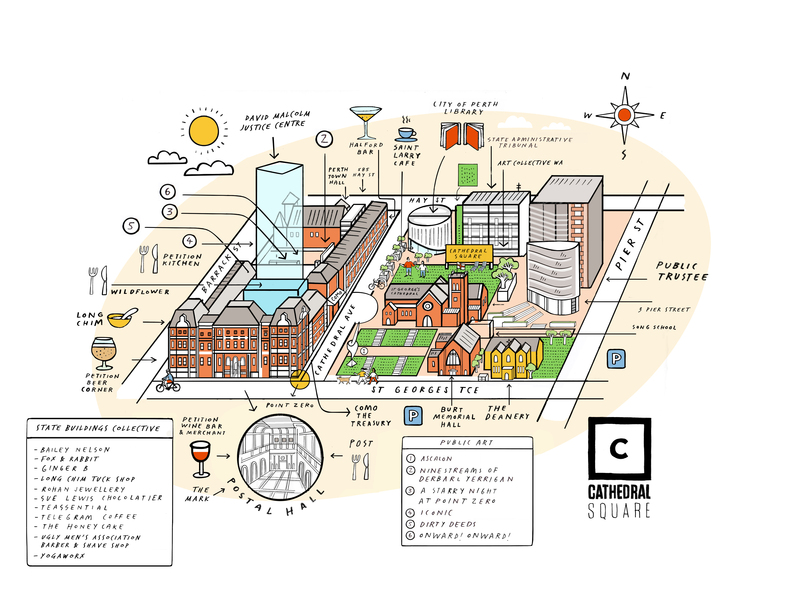 In particular I have to thank, Mirvac’s Development Manager, Megan Paine, and Form’s Project Manager, Elizabeth Davis, for their incredible work behind the scenes that has made this artwork a reality. For the collaboration with Barry McGuire, it was an unforgettable afternoon spent with Barry and my producer, Sue Italiano, up at Kings Park on the beautiful stretch of grass near the ANZAC monument overlooking the two rivers and the city that kicked off the project. As Barry gestured across the stretch of concrete in front of us and described the world his ancestors lived in before settlement, I was transported back in time and for moments could I really see the old campfires burning and the old songs being sung over and over for hundreds and hundreds of generations. As Barry pointed out many cultural sites used by his people, I was fascinated by the overlap in land use. How strange to think that two cultures operating with such different codes selected the same areas of land for similar purposes, for example, churches were built in traditional sites of marriage ceremonies where conducted. There is much, much more to relate from these hours of discussions and walks with Barry that I have space for here. What I can say in summary is that this sharing of stories has changed the way I look at Perth for good, and I feel much richer from the experience. What is your favourite finding from the research process? I love the story of Fanny Balbuk whose dramatic activities we only know about through the descriptions recorded by the anthropologist Daisy Bates. Fanny was born on Matagarup (now Heirisson Island) and her traditional songlines carried here up St Georges Terrace and into the swamps that used to lie at the site of the main train station. As development of the Perth continued into the late nineteenth and early twentieth century, Fanny continued to walk her songlines, digging up fences and walking through the rooms of houses that blocked her way. She famously would hurl abuse at Government House over the road from the Treasury Building where she said her grandmother’s bones were buried. Fanny’s shadow passes through theNine Streams in the Borna Malliji (Tree of Shadow) from time to time, waving her stick at anyone that would listen. The significance of the public artwork is that it complements the recent publications on this area of Perth history and offers another layer of accessibility to understanding the shared relationship with Noongar People. 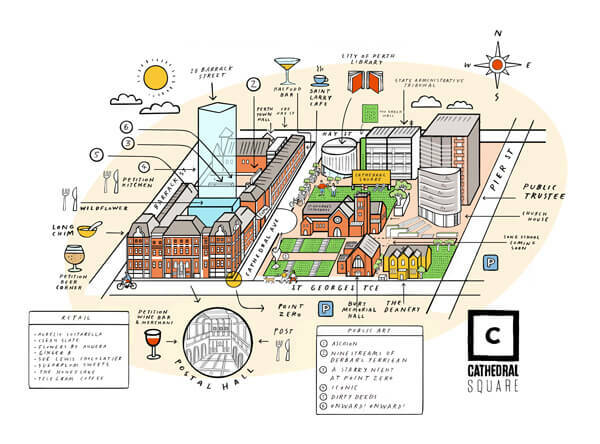 What do you want people to know about this work and the Cathedral Square precinct? I really hope that this work sparks the curiosity of all visitors, encouraging them to look a little deeper into the complex history of the Perth settlement and from there to explore their own relationship with Noongar people, many of whom are exceptionally brilliant and active individuals contributing a great deal to our lives. What personal connections do you have to the site and artwork? My introduction to the State Buildings came out of a game that I was involved in making called, The Secret of Point Zero. The game was an initiative of the then Awesome Perth International Children’s Festival who commissioned a fellow West Australian artist, Mick Hender, on the project. The game itself is an adventure trail around the City of Perth which starts at the WA Museum and finishes at the Barrack St Jetty. Players get to know the city by uncovering twelve hidden markers located in interesting sites around the city, including the Point Zero marker on the southern corner of Old Treasury Building. I remained intrigued with the idea of Point Zero as a beginning point for Perth and all that emanated from it. Nine Streams in the Borna Malliji (Tree of Shadow) is projected onto the west wall of Foundation Place, just metres from the site where a tree was felled to mark European settlement of Perth. A theatre of shadows, it’s a captivating piece that reveals the site’s history, and incorporates the living spirit of the city to create an engaging experience for any visitor seeking a deeper understanding of Perth’s complex history.